Over the last 5 years we have learned about some creative, smart, and enterprising ideas from our customers. Our client use tables at their events, classes, demonstrations, screenings, and shows, and share their creative programs with us. As we grow, we get better and better pricing from our solid relationship with FedEx. We pass along our discounted rates for big table and chair rentals to our customers via shipping tools on our website, and work to get those prices down for our customers regularly. This helps make massage and exam table and chair rentals affordable for more and more educators and organizations every year. We have also discovered some great ideas we want to share with you. 1. At conferences, make table rentals a sponsorship. Your corporate sponsor will be seen as a generous benefactor that helps take care of your conference or class student's backs, necks and arms! 2. At classes, ask participants to check a box if they are bringing a table themselves. Order tables 4 weeks before the event for the participants that are not bringing a table. We can provide online or customer sevice estimates for your event, so you know how much to charge your students that need the rental. You can split the cost between two participants and add this cost to the online or phone checkout for your program participants. Enjoy the benefits of bulk pricing as you handle the rental arrangements for your event. This includes bulk discounts for shipping as well as rentals. 3. Be a pioneer and provide table rentals for all participants at your classes, so you don't have to track who is bringing a table. Students love this. Just make it a line item in your budget, and be seen as the cream of the crop in education. Your evaluations will improve and your students will thank you. Have questions or ideas? Let us know what they are! 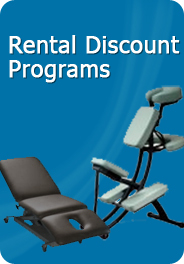 We are experts at getting your Professional Rental Equipment from MassageTableRentals.com to your events on time and at a great price. Let us know if we can provide pricing or explain the process!